Yes, I live in China, but I do miss American Chinese, especially the Orange Chicken at Panda Express. It’s not something I eat too often, but I will always have a place my heart for Orange Chicken. Below is some background I got from watching the Ted Talk by Jennifer 8 Lee, reading an article she wrote on fortune cookies, and some other internet research. General Tsai’s Chicken started out in a Chinese Restaurant in the New York in the 1970s invented by a Taiwanese Chef. Funny enough the original chef cannot recognize way the dish is commonly is cooked today. “Chopped, battered and fried chicken pieces coated in sweet orange flavored chili sauce” does not give the dish justice. 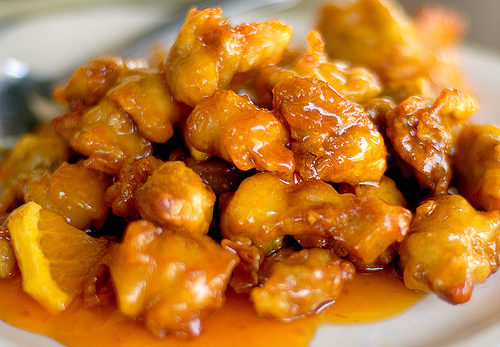 After some research, most websites consider Orange Chicken a variant of General Tsao’s Chicken. 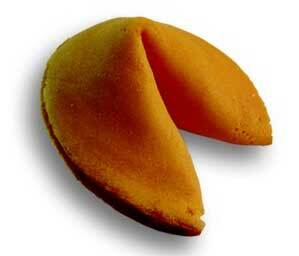 Originally I used to think the fortune cookie was invented in Los Angeles because I saw it on a poster promoting the city,(I guess they didn’t get their facts straight or meant the current form). From Jennifer Lee’s video and article, I found out that fortune cookies originated in Kyoto, Japan made with miso and sesame paste and not the vanilla and butter popular today. First evidence of the fortune cookie being from Japan is in 1878, and eventually immigrant bakers brought them to San Francisco and Los Angeles between 1907 and 1914. During World War II with many Japanese Americans forced into internment camps, Chinese Americans overtook fortune cookie production. Although Japanese in origins, Chinese Americans made the fortune cookie and brought it to it’s current fame in American culture .Here is the link to the article that written by Jennifer 8 Lee.